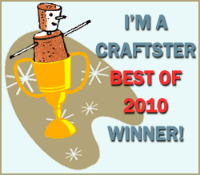 Craftster Best of 2010 – I’m in it! The best crafting site on the planet, Craftster, has awarded my post about our farm life as one of their best of 2010. They also awarded Mieljolie for the paper mache witch boot she made me in a swap and also my good friend Cackle who has taught me everything I know about polymer clay. Woo hoo! Congratulations!!! Connie, you are amazing and it is nice they figured out what we already knew. Not too bad for your first year! Oooh, what will you do to one up yourself next year?